Us men, we often have trouble organizing our stuff. From the macro level of our apartments all the way down to the micro level of our wallets. The interesting thing is that none of us will ever say that it is a matter of choice. We simply cannot be bothered. Now, I am not a cleaning expert and I cannot provide you with tips on how to clean your apartment in 15 minutes, but I can help you sort out that micro level. It is time to break with tradition and move on to a minimalist wallet. Not just any wallet, the best minimalist wallet for men! If you take a glance at our society’s history, you will be able to see that prosperity and improvement were inevitable consequences of breaking with tradition! Do not get me wrong, I am not promising a revelation. I just want to help you realize that making the transition from a traditional (be it a trifold or a checkbook) to a minimalist wallet comes with certain advantages and does make life a bit easier. Having questions and concerns is absolutely understandable, so it would be best to address the most common ones prior to delving deeper into the market. The last thing you should worry about is how you will end up choosing the right minimalist wallet for you. Just let your preferences lead the way. It is as simple as that. Luckily, the market is big and the options are innumerable. This means that whatever material, colors, and features you are most into, there is a perfect item for you. For example, if you are an animal rights activist, finding a non-leather wallet will not be a problem. Polyester is all across the market in all shapes and forms, and some polyester wallets are as durable as they come! Nevertheless, make sure to question yourself prior to cashing out for a certain item. Do you really want it? Does it provide all the features you are interested in having? Does it fit your budget? You know, the essentials. Believe it or not, there are more reasons for making this transition than for sticking with the traditional bulky wallets. Firstly, by owning a minimalist wallet you force yourself to carry only those things that are of utmost importance. Just a couple of credit cards, a bit of cash, and your ID card. Secondly, you get to say goodbye to those uncomfortable situations your travel wallet puts you in. People are impatiently queuing behind you while you are taking ages to find, pull out, and put back your credit card. Thirdly, minimalist wallets fit in your front pocket. Easily. How many times have you sat down and felt your wallet just stabbing your behind? After a while, you might even start to experience excruciating pain. Should we mention that it is more difficult for pickpockets to spot these card holder wallets? The list, of course, goes on and on, but more questions are waiting to be answered! There are some important features all minimalist wallets should have. I mean, it is not mandatory, but these features help make life easier. Primarily, I need to point out the credit card pull-strap. I applaud each and every manufacturer who recognized the importance of this feature! These pull-straps genuinely facilitate the action of pulling out your credit cards. Some manufacturers, however, have figured out another way to deal with this problem. They equip their wallets with easy access front pockets. Basically, they leave a small opening on the front of the pocket, making it easy to slide out your most important credit cards. Also, since it is impossible to be safe enough, try landing on a wallet which has RFID (Radio-frequency identification) protection. Unfortunately, there is a lot of skilled thieves out there and having a wallet with RFID protection will help you have the edge over them. Lastly, if you are looking for a men’s money clip wallet with, make sure that the clip does perform its job well. If it is too loose, you are risking losing your cash. Just throwing the information out there. Do you get good value for money with minimalist wallets? That is a really important question. I understand that a lot of controversies are circling around these products, especially wallet phone cases. Some of them are pretty expensive and that leads people to think that they can not possibly live up to their price tags. The truth is, some of them do not and that is why you have to do a bit of research prior to buying a particular slim wallet. On another note, it is crucial to state that the price tag is often a very reliable indicator of quality. Look, minimalist wallets can sometimes be harder to manufacture than leather trifold wallets. In order for them to be as reliable and long-lasting, manufacturers have to use special methods and technologies. Needless to say, they do influence the price of the final product. So, if you are worried about the “They are overpriced” controversy, try to remember that quality always comes with a price. In order to find these products useful, you have to be ready reduce your wallet essentials to the bare minimum. If you are not prepared to that, settling for a different type of wallet might be a better solution for you. However, keep in mind that some minimalist wallets do provide enough space for more than a couple of credit cards, a bit of cash, and a few receipts. The market is huge. Products are uncountable. However, not every minimalist wallet can be a contender for the title of the best minimalist wallet for men. If you were to ask me, only these ten items have the right to fight for the title. Let us see what they have to offer. The Dango Tactical EDC Wallet was a sensation when it first appeared on the market a couple of years ago. It promised an unparalleled level of quality and practicality. What made it particularly stand out, was its stainless steel multi-tool. From what I can count, and from what people at Dango state, this multi-tool includes 14 different features. You get a bottle opener, pry, knife, saw, wrenches, smartphone stand, paracord tensioner, and many more. Not only is it fiercely handy, but they have managed to pull off the look as well. The genuine top grain leather pouch combined with the 6061 aerospace grade CNC’d aluminum frame and some stainless steel screws makes a hell of a statement. Also, you get enough space to store up to 12 credit or business cards. But, it comes at a price. $89 price. Nevertheless, do not jump to any conclusions. If you ever get the chance to hold it in your hands and use it briefly, you will understand the price tag. Quality always costs a pretty penny. Looks elegant but intimidating, like a true man’s wallet. Genuine top grain leather that is secured to the Dango Wallet chassis with mil-spec bolts. Comes with Dango Multi-Tool: CNC-machined high carbon stainless steel with over 10 functions, including a saw, knife, paracord tensioner, 10/15mm hex, smartphone stand, nail pryer, ruler, etc. The multi-tool is easily removable from the wallet and can be either checked or left at home when traveling. 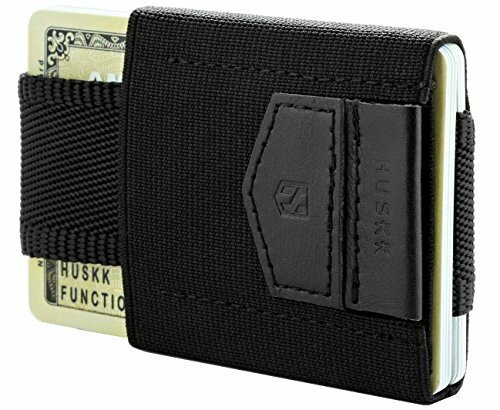 Here is the UK built minimalist enthusiast’s dream HUSKK Minimalist Slim Wallet . Could not be lighter, could not be easier to use. This slim wallet is made from medical grade elastic and genuine premium leather. What is great about it is that it comes with two separate pockets! One to store your credit cards (up to 10) and cash in, the other for your keys and other smaller objects like a memory card. Remember our advice from the beginning of this article regarding the pull-tab? Oh, yes. This beauty comes with a credit card pull-tab. In case you were wondering just how compact this wallet is, here are its dimensions – 3.4-inch x 2.2-inch x 0.1-inch. When you slide it into the front pocket of your jeans, it could not be more inconspicuous. Goodbye pickpockets, see you another time! Another great feature worth mentioning is the secure grip that the pouch provides. I am pretty certain that when you pull the tab, you are not looking to spill your cards all over the floor. That is why this feature is so important! EASY TO USE : Thanks to special designed elastic material have instant access. This wallet holds more than just cards. The built in pocket allows you to carry cash, a key, and other small objects. When it comes to travel wallets, this one right here might be the champ. I love it when manufacturers introduce features that have either never been seen before or are very rare. What sets this particular minimalist wallet from the herd, is that it is incredibly thin and made from Soft Shell material which allows it to be durable as well as waterproof! SlimFold Minimalist Wallet promises that the material is more damage resistant than leather. Like all of that is not enough, the interior lining is also stain resistant. SlimFold also thought about safety. If you invest additional $3, you get RFID protection as well. That really is a small price to pay for an increased level of security. In case anything goes wrong with the wallet or if any of the promises made by SlimFold are not delivered, you can always rely on their 5-year warranty to have the situation fixed. Also, you get a few interior pockets which help with storage and organization. Organize up to 8 cards while being 2-3 times thinner than leather wallets – The thinnest most convenient package possible with no compromises. We custom produced the high performance Soft Shell material to achieve ultimate durability and waterproofness: Like crossing the properties of Kevlar and GORE-TEX… so it feels like a high end ski jacket but is much thinner and more abrasion resistant than leather. Protect your personal and payment information from being stolen at a distance by choosing the RFID blocking option. Since 2009 SlimFold has been a leader in the minimalist wallet revolution and has delivered over 100,000 wallets to customers in 70+ countries. Our products are still MADE IN USA and we stand behind this wallet with an industry leading 5 year warranty. The best way to know if this is the perfect wallet you’ve been looking for is to experience it for yourself. Put your cards in it and you’ll know instantly. Not right for you? Just send it back. Well, it does not get more minimalist than this. If you are not a cash person, you will certainly find this card holder to be a gem. Quite frankly, even though there is not much to it, this “wallet” is pretty pricey. Why would that be the case you may ask. Every wallet is made from a single billet of 6061-T6 Aircraft-Grade Aluminum. How is that for an answer? However, it does not provide you with RFID protection. As you may expect, this wallet card holder is very light. In fact, the smallest 4-card version weighs only 13 grams. Yes, you have heard it correctly, you are able to choose between three different sizes. The Decadent Minimalist Men’s DM1 Aluminum Wallet comes as a 4-card, 8-card, and 12-card version. The most reassuring feature of this wallet is the clicking sound you get when you slide your credit cards into it. Seriously, your credit cards would be as safe as they can be with this wallet. 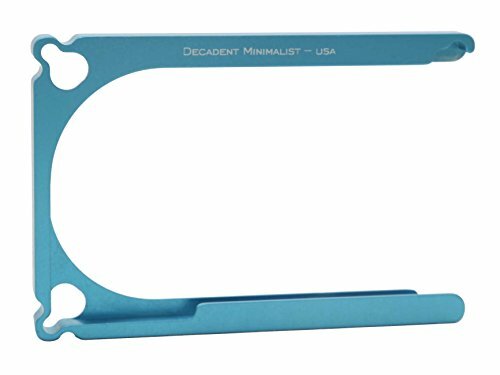 Let me also mention that DM1 can be purchased in two scratch resistant Type III Hard anodized finishes or many Type II anodized colors. 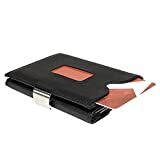 If you are interested in purchasing a beautiful leather wallet with a money clip, I think you should look no further. Trayvax Element Wallet is one of the leading manufacturers of minimalist wallets on the market. Their products are incredibly well built and insanely practical. The Element is no different. 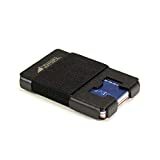 It can store up to 12 credit cards, and like I have said, it comes with a money clip which allows you to carry some cash around as well. Tryvax Element Wallet has a stainless steel frame which is wrapped around in a top-grain leather. It truly looks amazing. Of course, Trayvax made sure to include RFID protection as well. Also, since us men have a natural tendency towards opening bottles, you will be thrilled to find out that the Element comes with a built-in bottle opener! 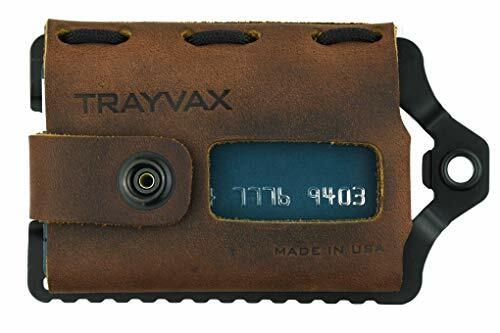 Now, people at Trayvax are so confident in their products that they even provide their customers with a lifetime warranty on all of their products. Unlike the Dango Tactical or Trayvax Element, which have a more masculine essence, the Radix One is more contemporarily designed. It is very smooth and slick looking, making it ideal for fashionable younger men. The Radix One includes a polycarbonate plastic frame and a silicone band which functions as a money clip. Those are basically all of its features. Like all other minimalist wallets, it is incredibly thin and light (weighs less than one ounce). You would be able to fit between 4-10 credit cards in it, as well as some cash which would be protected by the Radix’s durable silicone band. All essential benefits that minimalist wallets provide, the Radix One provides as well. It easily fits the front pocket, does not strain your back, and forces you to reduce your pocket essentials to the bare minimum. In case you like experimenting with colors, Radix allows you to choose between three frame (black, white, and smoke) and five different band colors (black, gray, red, cyan, and dark blue). The price? You really should not worry about it. The Radix One is as affordable as they come with a price tag of just $14.99. EFFICIENT – comfortably and securely holds 4-10 cards. PATENT-PROTECTED SLEEK DESIGN – store both cash and cards in an ultra slim profile. Here is a proper men’s designer wallet. Now, the triHOLD is interesting because it is basically a tri-fold wallet but compact and light enough to be categorized as a minimalist wallet. It was actually made to fit your front pocket. Priced at $45, it is not exactly the cheapest of the lot, but it is made from black napa leather which makes it look very elegant especially when combined with a stainless steel clasp. The triHOLD provides enough space to store up to 12 credit cards and it includes a full-size billfold which is great for keeping your cash and bills in. Additionally, it comes with a ticket holder and a credit card easy access window. This last feature is a great alternative for the pull-tab. Surely, there are some cards that you use more often than others, and the front pocket with the easy access opening is the perfect place to keep them in. 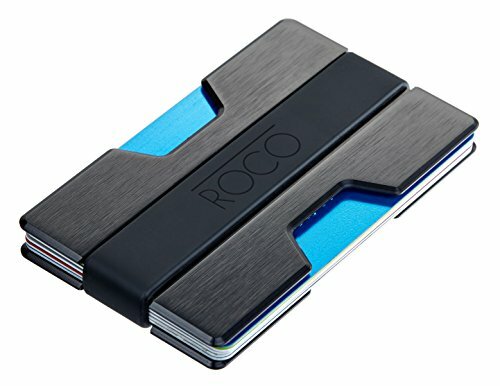 I find this Roco wallet incredibly good looking. For some reason, aluminum frame minimalist wallets simply look better to me. Would you not agree? Even though this Roco wallet is made from aluminum, there is a vast array of finishes to choose from. There is something for everyone. Amazingly enough, this wallet is capable of holding up to 20 credit cards! Think about that for a second. In order to accomplish this, the Roco comes with two silicone bands. One for a large amount of cards and one for a small amount of cards. Of course, the silicon band can be used for cash carrying purposes. Also, as you would expect, the Roco comes with RFID protection. So, it is durable, light, compact, and extremely good looking. What else could you ask for from a minimalist wallet? BLOCK THE THIEVES Thieves are becoming increasingly smarter in stealing personal information. 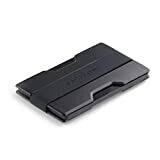 With the ROCO MINIMALIST RFID Blocking Money Clip, keep your personal information contained within your credit cards safe! SUPREME QUALITY ROCO is committed to designing quality products. It’s for this reason the ROCO MINIMALIST wallet was designed to be ultra slim crafted with a high grade aluminum. Crafted with a patented, flexible silicone band, the ROCO MINIMALIST RFID Blocking Money Clip is highly flexible, yet won’t lose its strength & stability. ULTRA SLIM ROCO’s engineers desired to create a minimalist wallet which would be perfect for business cards, credit cards, driver’s license, and so much more! It’s elegant, compact design allows for front pocket or rear pocket storage. Even with its slim design, the ROCO MINIMALIST RFID Blocking Money Clip can hold up to 20 cards. PREMIER CRAFTSMANSHIP ROCO pursued an obsessive attention to detail & our wallets are made from top industry standard aluminium metal. Each individual piece is uniquely crafted for superior strength and stability. You’ll love carrying your cards in the ROCO MINIMALIST RFID Blocking Money Clip! Here is something completely new! A wooden wallet! Call me old-fashioned, but there is no material more appealing to me than wood. This Fidelo front pocket wallet is made from premium grade American maple. It is very thin, light, and good looking. The second interesting feature, apart from the maple frame, is the band which is not made from silicone. Non-silicone bands are great because they prevent potential stretching! These money bands come in four different colors – black, forest brown, smoke gray, and copper. This Fidelo front pocket slim wallet holds a promise of being able to hold up to 15 credit cards. Now, if you ask me, that is more than enough! In case anything goes wrong with the wallet or if it does not meet your expectations, Fidelo provides its customers with a money back and a satisfaction guarantee. That is good to know. Lastly, this slim wallet is very reasonably priced. Currently, it runs at $18. LIMITED TIME SALE + COUPON . PLUS – Buy 2 or more & get 10-20% OFF! Enter code UWILSAVE at checkout 【THE WOODSMAN “MAPLE”】 Mens wallets were designed to hold PAYMENT, GIFT & MEMBERSHIP CARDS (up to 15) & CASH. These small wallets INCLUDE 4 money band colors: midnight black, forest brown, copper & cream. The 4 premium elastic bands with fashionable leather accents are durable and resilient. WON’T stretch-out like silicone or latex bands. 【MODERN DESIGN with EASY CARD ACCESS】 Genuine premium grade American Maple wooden wallet, super thin, modern sleek look & smooth polished edges resulting in an aesthetically handsome for men wallet. HOW TO USE: Setup – Insert credit cards between plates > slip cash under elastic & on top of plate (use leather ascent as a lift tab). Card Retrieval – Push cards out > squeeze plates together to fan out cards > select desired card & push remaining cards back in. Repeat to return card. 【PURCHASE RISK FREE WITH OUR 100% SATISFACTION GUARANTEE】 If you’re not completely satisfied, then neither are we! All FIDELO minimal wallets are backed by a NO HASSLE 100% MONEY BACK & SATISFACTION GUARANTEE. If you have any issue whatsoever, we’ll fix it! Simply contact us and our support team will make it right. Not sure if you believe us? Simply read some of our 5 STAR REVIEWS to put your mind at ease! 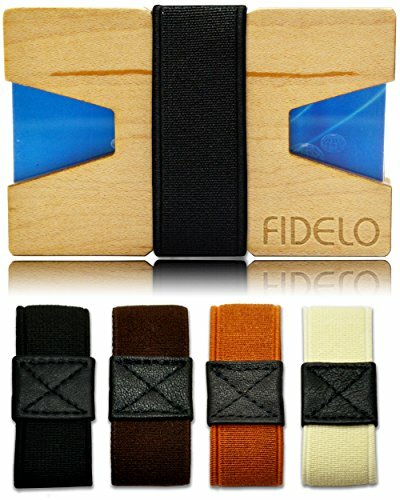 【 BEST GIFT FOR MEN】 FIDELO Slim Wallets for Men make the best gifts for men who have everything. A great Christmas, birthday, fathers day, anniversary, graduation or just because gift. Look no further and surprise him with this stylish minimalist wallet. Yes! Yet another wallet multi-tool. I personally love to get my hands dirty. I think that men generally like to be perceived as being handy. We like to be the problem-solvers! Rugged Material, like Dango and Trayvax, is one of the manufacturers which sets standards and changes trends. 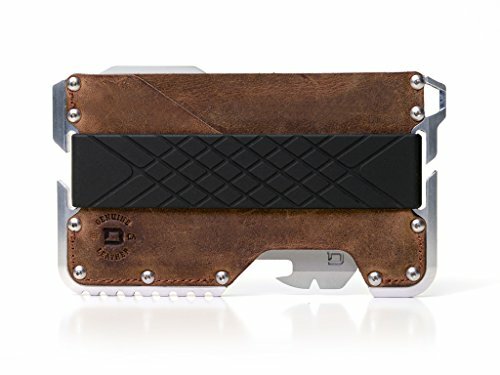 Their Ranger Minimalist Wallet multi-tool is a perfect case in point. 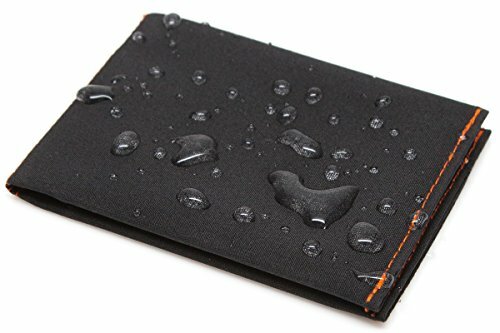 The steel frame of the wallet is coated with high-quality powder coat finish which is corrosion resistant and provides an unparalleled level of durability. Of course, it includes RFID blocking, a money clip, and enough space to store 8 credit cards. Moving on to the multi-tool. Yes, it has a bottle opener. A man has to have a bottle opener on him at all times. However, you also get a flathead screwdriver, ¼ tool driver, SAE wrenches, and metric wrenches. All essential tools are basically included. Let me start off this conclusion by saying that my personal preferences are mine alone. If I say that I prefer one feature over the other, that does not necessarily mean that it is objectively better. Having said that, I think that it is time to announce the winner of this incredibly close race! If I am honest, the Dango Tactical EDC Wallet looks and feels like no other minimalist wallet on the market. The simple masculine design combined with top-notch materials makes it hard to resist. It is as sturdy and durable as a wallet could ever be and it faithfully adheres to the core principles of minimalism. It forces you to carry only the most necessary things, it keeps your wallet organized, and it provides RFID protection. In addition to all of that, you get a decent multi-tool with 14 different functions! Whether you decide to fix something around the house or go camping, you would be equipped with all the necessary tools you could ever need. Do not get me wrong, all of the abovementioned minimalist wallets would do the job just fine, but they do not have the X-factor. Which man would not love to have his most essential piece of accessory be a real conversation starter? Dango Tactical EDC Wallets simply attracts attention. That is the X-factor. It makes you feel special. I think that men, in general, enjoy having things that make them feel special. The Dango Tactical does that. That is why it is number one for me.